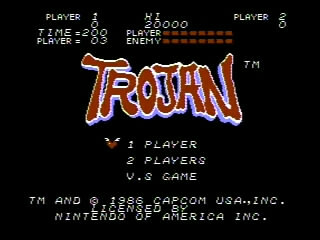 Released in February of 1987, Trojan was one of Capcom's first offerings for the NES. In this port of the arcade game, you take control of a Trojan warrior by the very non-Trojan name of Ryu and battle your way through a post apocalyptic world in an attempt to bring an end to the tyranical reign of the warlord Achilles. Best time: 0:06:50 by Daniel 'Dxtr' Eriksson on 2012-09-01. There isnt much to say about the run itself. It all went down to if the armadillos were to coop or not. And they did! Everything went as planned besides the last stage before the Stone Golems, got very bad RNG there and the enemies spawned in front all the time. So a couple of seconds lost there. Other than that, decent run!